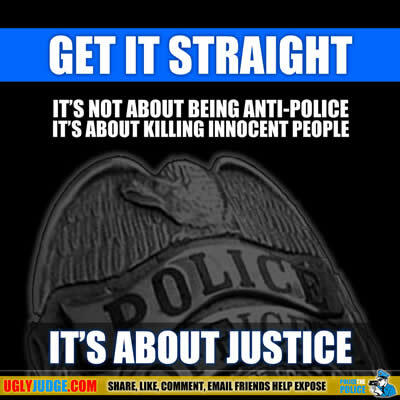 Police unions, management and supporters should be ashamed of themselves. They’ve been manipulating the truth and justice for decades. They hide behind a badge of shame and propaganda that stands in the way of accountability and justice. You’re supporting an image that is only as good as the weakest link. Ask any of the families of thousands of INNOCENT PEOPLE who were killed by police. Ask them about the so called non-objective, highly biased “Justified Investigations” which are nothing more than a way to legalize “Murder”. If anyone else did the same they’d immediately be in jail, pressured for a confession, polygraphed and have their characters assassinated. They’d be guilty till proven innocent and at the mercy of a broken system based on how much money you have and not justice or fact. What happens to GOOD COPS who take a stand and expose the evil that goes on behind closed doors? What happens to anyone who does not go along with a flawed system we all know is broken? Why does the top Sheriff of America step down and retire early instead of facing prosecution and justice? Why are judges allowed to retire instead of being prosecuted for perjury, dishonesty and fraud? Get the picture, some people are in fact treated as being “ABOVE THE LAW”. Since when is speaking the truth wrong? Since when is killing rationalized to the point that even when video evidence exposes “wrong” it’s called “Justified”? ASK THEM IF WHAT IS GOING ON IS REAL, FAIR OR MORAL? Want more victim’s try Googling “shot in the back by police“. Why are Police statistic’s (concerning people killed by police) not accurate? What’s the benefit of hiding or not reporting these statistics? How many people were killed without video evidence and police lied?